We were all set to take off on time when the captain announced that five people hadn’t made it on board, but since their luggage had, it needed to be removed. An hour later we headed off. How do people manage that? Intermittent cloud revealed great views over the Alps, over Nice and down over Sicily. The guy due to pick us up is hard to find – having a coffee in a corner with our signboard firmly tucked under his arm, but we are eventually on our way to the Hotel Argento on Qaliet Street in St. Julians. It’s a tight, trendy harbor inlet heaving with people and traffic. We stroll along the promenade on Spinola Bay and have dinner at a posh restaurant called Barracuda. 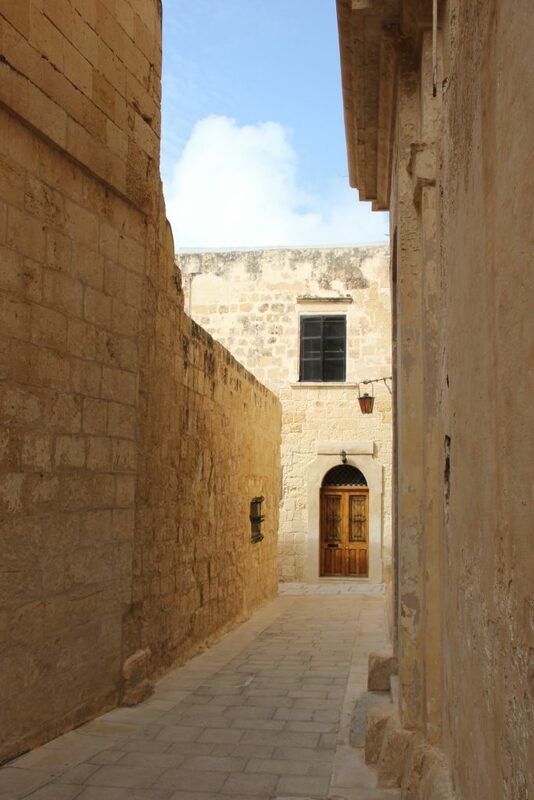 The next day we take a taxi to Mdina – the so-called ‘Silent City’ mainly populated by nuns in convents. With barely any cars, it’s a postcard of narrow, immaculately manicured streets. It’s in a commanding position on high ground with views of much of the island, but the view isn’t very exciting to be honest – some perfectly pleasant farmland, but often messed up by unruly modern development. 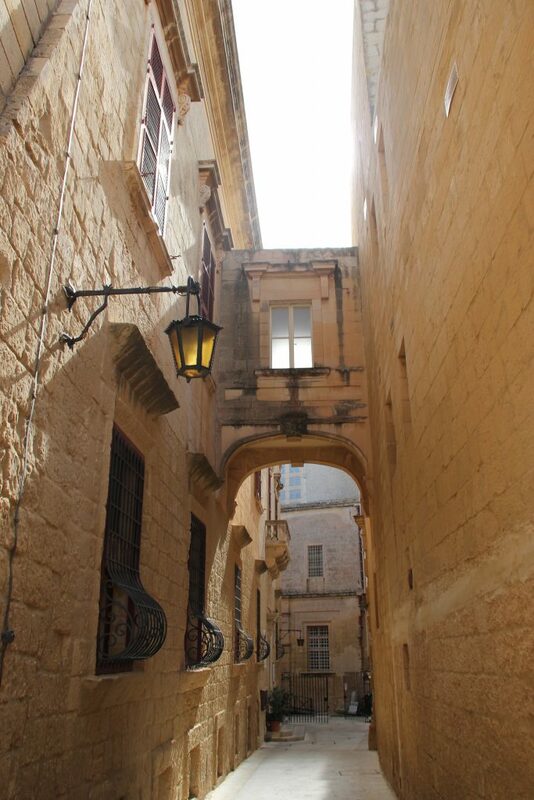 Next we head to Valetta. In theory this is a UNESCO heritage walled city with great architectural merit. In practice it’s a crowded mess – heaving with tourists like Dubrovnik or Lisbon old town. Outside the walls we grab a beer overlooking Deagut Point and Manoel Island. It’s a tangle of old and new, with seemingly no planning consideration. We have an excellent Italian meal in Sotto on South Street before heading back. In the evening we have another good meal in Peppino’s overlooking Spinola Bay – very succulent tuna and chilled Gavi. 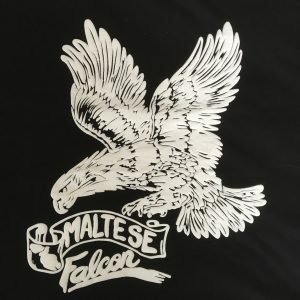 The next day we head to Gozo, hoping for more rustic things. The bus takes a fair while picking everyone up in St. Paul’s Bay but eventually we are on the ferry over, and it’s a beautiful day. We cruise past the Blue Lagoon on Comino, where hundreds of boats pile in to swim. Gozo is not as good as it is made up to be. The coach clatters through some improbably tight streets, and the countryside is pleasant enough, but it’s not that exciting. We stare down at Ramla Bay from on high, and visit Xaghra, home of the Ggantia Temples. These are purported to be the oldest freestanding stones in the world. There’s a small, neat museum, and then a pile of ancient stones. Nice enough, but only just worth the visit. We have lunch at Il-Kartell overlooking the sea at Marsalform, and catch the bus back via Victoria. At the terminal back on the main island, our bus is full so we take a cab back and gain an hour. We round the day off with a huge pizza at Gululu on the waterfront in St. Julians. Sunday is a day of rest, particularly in a highly devout Catholic country where every house seems to be named after a saint. All this despite the language being closer to Arabic, but using the Latin alphabet. On Monday we call an enterprising local taxi driver who has given us his card, and for 25 Euros an hour he will take us anywhere on the island. 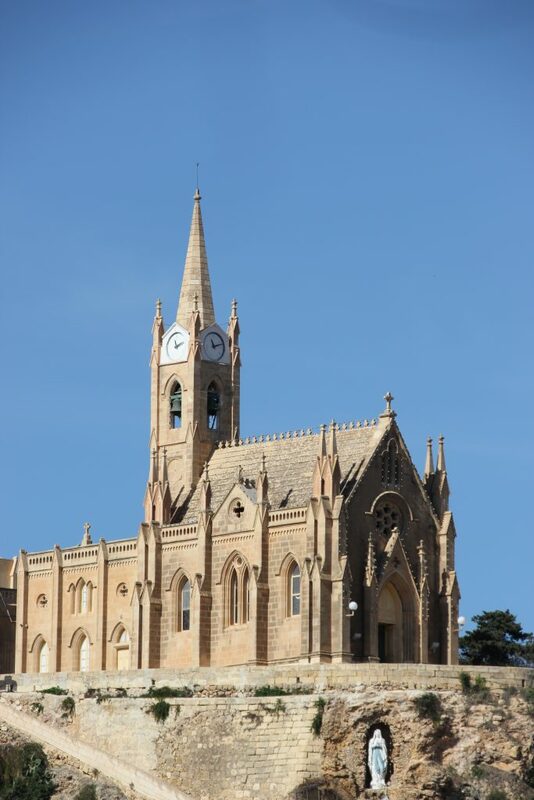 We start with the ancient temples of Hagar Qim and Mnajdra – older than the pyramids. These show freestanding stone structures from neolithic times. They are in a charming location on the south coast, opposite an island called Filfla that the British military used to use for target practice. On balance, this is more interesting than the temples on Gozo. 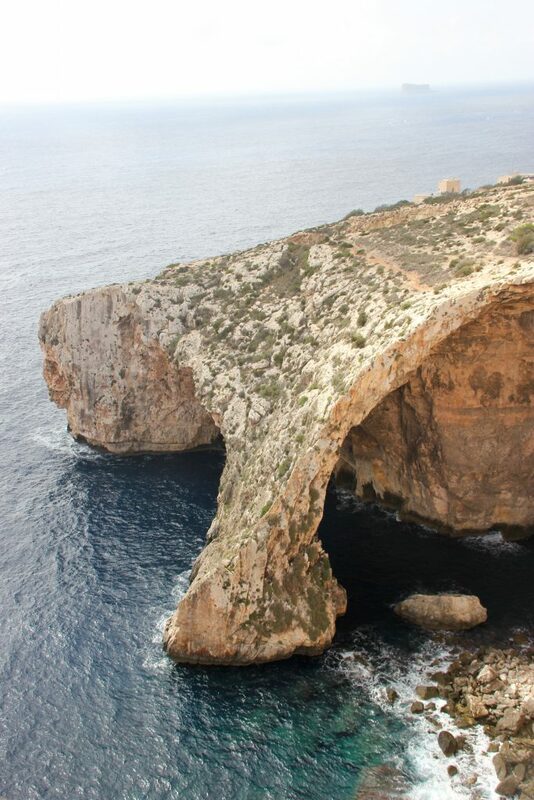 We drive on to stare at the Blue Grotto from on high. It’s a large arc of stone forming an arch. On calm days there would be hundreds of small boats under it, but today it’s too windy. 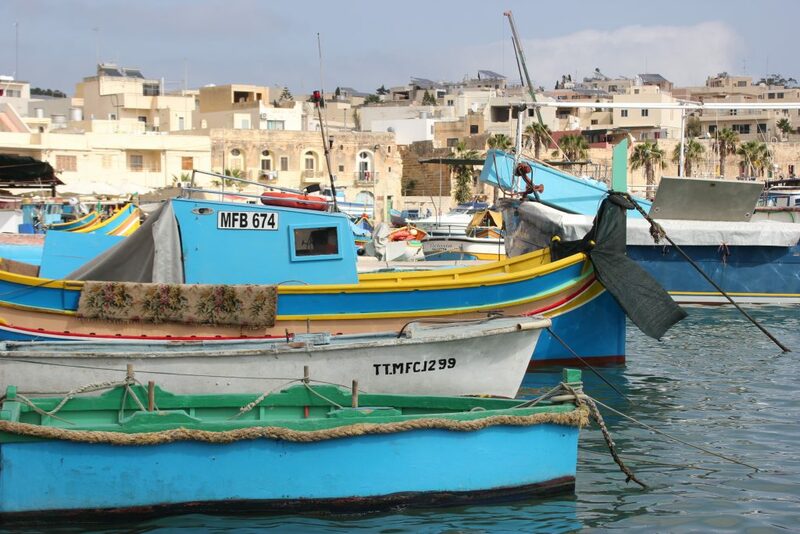 Then on to Marsaxlokk, purported to be an idyllic fishing village with a famous market. It’s a fairly conventional harbor with some boats, a large power station, and couple of enormous tankers in the bay. Any idea of kitsch fisherman photography can be abandoned here. There are plenty of decent restaurants overlooking Spinola Bay, and we try most of them in one way or another. Girasole has very friendly staff and great pasta. Dolce Vita is at the posh end, requiring pre-authorisation downstairs to get in the lift and be admitted. And having just seen the disappointing Marsaxlokk waterfront, this is a civilised step up. Concluding remarks on Malta. We were expecting a great deal more. Guidebooks and travel literature makes great play of culture, history, and beautiful geography, but it’s not really true. Of course the weather is usually a bonus, the food is good, and the people are perfectly friendly, but there is a fair bit on the minus side. The landscape is fairly bland – flat and dry in the main and pretty unremarkable. The urban developments are something of a disaster, with no apparent planning policy. Hundreds of enormous cranes suggest that there is construction money available, and yet thousands of older building remain dilapidated and unrestored. The result is a mess. Traffic is unruly and many vehicles belch diesel. 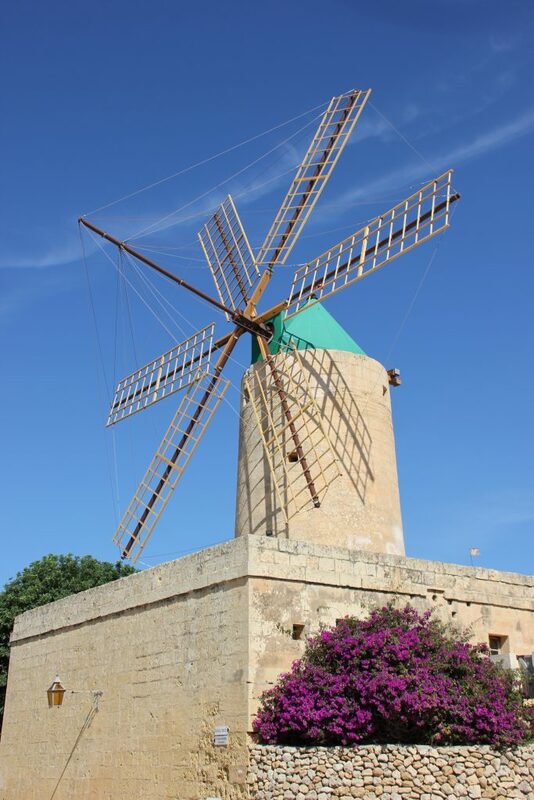 Gozo – much vaunted as an island paradise – is pretty workaday. Almost every waterfront resembles Southend, possibly due to British influence until independence in 1964. A maximum 6 out of 10 when in a generous mood and with the island at its best, but falling to 3 out of 10 in its worst moments. Should be low on any travel list.